I am once again contacting you regarding Americans living abroad in cases of divorce, custodial hearings and domestic abuse. 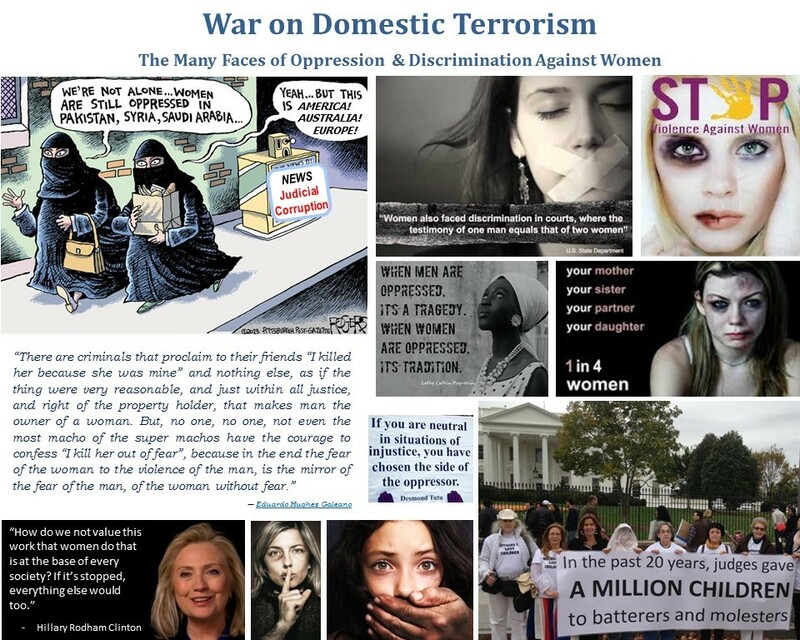 In the past 6 years the American Embassy/Consulate in Madrid, as well as the US State Department, Consular Affairs Division in Washington, DC have contended that cases of domestic abuse/divorce of American women and children living abroad are “private matters” and “civil disputes,” and that they are under no obligation to assure that the rights and interests of Americans are respected in foreign courts and foreign jurisdictions. This position is contradicted by the promises, speeches and rhetoric of US government officials (President Obama, Vice-President Biden, US Secretary of State John Kerry, Former US Secretary of State Hillary Clinton, postings on the US State Department website, and publications of the US State Department[i] [ii]). It is also contradicted by legal precedents in human rights law (Inter-American Commission on Human Rights, Gonzales vs. USA and Velasquez vs. Honduras, and the European Courts of Human Rights in A vs. UK, www.aclu.org/human-rights-womens-rights/jessica-gonzales-v-usa,) which establishes a State’s obligation to protect under the principle of due diligence. And, it is further contradicted by the guidelines set down in FAM, for Americans living abroad, victims of crime/domestic abuse. The American Consulate in Madrid’s policy of non-compliance with art. 5, 36, 37 & 38 of the Convention of Consular Affairs, FAM, and human rights law, inter alia in conjunction with the lack of due diligence by government regulatory agencies in Spain sends a clear message of impunity to judicial actors in Spain, who are thereby in a position to abuse their powers and violate the rights of American residents. As an act of good faith, and in my efforts to avoid future litigation, I am once again soliciting the assistance of the American Consulate in Madrid under the Convention of Consular Relations and other applicable international treaties, to assure that the Colegio de Abogados, Defensor del Pueblo, and Consejo General del Poder Judicial examine and investigate my allegations and the facts of my case with the highest standard of diligence; holding all responsible parties accountable to the letter of the law. Please see enclosed my letter to Consul General Peggy Gennatiempo requesting assistance. As the American Consulate is aware (as they have diligently been informed of the facts of my case from the onset) my ex-husband’s violence and threats upon my life (and blocking of access to all assets and funds) were caused by his efforts to prevent me from providing financial independence for me and my children, and the creation of Global Expats. Legal counsel and court officials who have been complicit in these efforts, are accessories to his crimes and responsible for all and any financial damages incurred by me and my company. Global Expats is modeled after the Federation of American Women’s Clubs Overseas (FAWCO), but is a revenue-generating entity which remunerates its trailing spouse managers and employees, as well as assistants them in career maintenance and entrepreneurial efforts. Revenues are generated from a networking/local search, city-guide global website with present estimated lost opportunity costs at $200 million. International organizations such as the IMF, World Bank and United Nations are increasingly examining the link between corruption and the present economic crisis. My case provides a perfect case-study on how and why widespread corruption in the courts impedes economic growth and entrepreneurial development; and the role negligent governance by regulatory agencies is playing in promoting widespread corruption in the courts. Traditions and customs, which silent victims of domestic abuse are omni-present in Spanish society, and justified under the belief that protection of the “family honor” is for the “greater good.” In most cases victims have little understanding of legal codes and principles, and are easily duped by unscrupulous judicial actors who abuse their power with total impunity. In my case, not only have I understood the dynamics involved, but have documented all irregularities and infractions of the law. My legal battles are no longer only about the particulars of my own case, and recuperation of financial damages, but are about establishing proper protocol and “good practices” that will prevent the violation of the rights of other women and children in the future. Preventing the violation of the rights of American women and children in foreign courts is not as difficult as many US State Department employees pretend, but will necessitate a commitment from American Embassies and Consulates to utilize their power and authority under the Convention of Consular Relations and other applicable international treaties. It is to this end that I hope the American Embassy and Consulate in Madrid will assure, through appropriate channels and as provided for under international law, that the Colegio de Abogados, Defensor del Pueblos and Consejo General del Poder Judicial will thoroughly investigate the facts of my case, holding all judicial actors responsible for their professional and criminal negligence. For your convenience, I am including a copy of my correspondence to other US State Department officials which provide additional information about the issues involved and the enormity and gravity of the situation. When a U.S. citizen finds him or herself in a foreign government’s custody, a consular officer is often the best, and sometimes only, resource that citizen has as he or she navigates a foreign legal system. Letter to Plehn Abogados (December2012) requesting his assistance in arriving at a financial settlement with all previous legal counsel (Gonzalo Martinez de Haro of Vanander, Carlos y Associados (American Embassy website listing); Belen Garcia Martin (Plehn Abogado – American Embassy website listing); Jose Manuel Hernandez Jiménez (abogado de oficio); Jorge Capell of Cuatrecasas, Gonçalves Pereira (American Embassy website listing); Alberto Fontes Garcia Calamarte; Miguel Martinez Lopez de Asiain & Ignacio Gonzalez Martinez; and procuradores[iii] Juan Bosco Hornedo Muguiro; Maria Pilar Lantero; Pilar Poveda Guerra; and Rafael Gamarra Megias) for their professional and criminal negligence in Wilcox vs. Gonzalez de Alcala (2007) and Gonzalez de Alcala vs. Wilcox (2007-2012); as an act of good faith and in order to avoid future litigation against them.